It was 2:03 when my stepfather, Walt, ran over the 30k mark at the Boston Marathon. Looking at his pace, which was sent to me through an automated text message, I figured I had at least an hour to get to my regular cheering spot near the corner of the Mass & Comm avenues. I waited a few more minutes against the barricade, watching the runners speeding by, and the crowd cheering them on. In front of me a couple in their early 30’s shouted and screamed, individualizing each call. “Yes, Canada, yes! You’ve got this Sheri! Only two miles to the drinks, Mark!” I chuckled thinking to myself; if you like to clap for seven hours, attend a marathon. (I admit that some brainwashing has been done at Pass It Along, where we are trained to see the good in the world.) I picked up Walt’s post-run chocolate milk and got a front row spot to cheer on the runners, and eventually, my stepfather. Suddenly, something halted the runners. They stopped as if an invisible wall had gone up, holding them back. I leaned over the barricade, trying to see forward to what was happening. Next to me, a man answered the question for the crowd and the quickly growing number of runners. “There were two explosions at the finish line—bombs or something,” he said. I realize now that it is one of those moments where I will always know exactly where I was and what I was doing—my first reaction was to look at my phone—3:02. There was no way Walt could have gone by. There was no way. He didn’t have his phone with him, but mathematically, unless he had been injured running, he would not have been there. I did not have to look hard that day for the helpers. As half a dozen people borrowed my phone, I watched the crowd around me. Some runners sat shaking on the ground, freezing without the Heatsheets that were usually wrapped around them at the finish line. Spectators pulled off their coats and sweatshirts without hesitation, offering it to those before them. When the first call for water came out, a dozen offers went in. My phone buzzed; Walt had just crossed the 40k mark. He was less than two miles away now. I was able to send a message to a friend, asking them to let my mom know that we were okay, and left the site. The barricades had been broken apart, allowing runners out and spectators in, so I walked on the trail, not wanting to miss him. People had run into their nearby homes only to return moments later with pitchers and bowls full of water, offering it to the incoming runners. A ten-year-old boy wandered through the crowd with a bag of clementines, handing them out to those in need. I was able to find Walt, who said he had heard a few miles back what had happened. But I could see that as fast as the word had spread, so had the kindness. As time went on, we all heard of the runners who kept running straight on to donation sites to donate blood, those that pulled off favorite shirts and belts to make tourniquets, and so many other small and large miracles. Those who watched what had happened from the outside saw the fear, but from the inside, we saw so much kindness. Have you ever had one of those days when you find yourself completely overwhelmed by the tasks, events, and excitement at hand? And you almost begin to panic, wondering how it will all get done, when you realize, with a sigh of relief, that everything on your lengthy to-do list is fun and enjoyable? Pass It Along is having one of those days. And that day is April. That “day” encompasses a solid month. We are only on the second week into this seemingly never-ending month, but so much has already happened. As Maren wrote last week, we had two concurrent Alternative Spring Break activities going on at once. Not only did we have our local volunteers come out to Swartswood State Park, but we also hosted a group from outside of Philly. And this was only the warm-up. The action continues on the 19th, when we will be hosting Box City at Sussex County Technical School. This service-learning sleepover promotes and expands homelessness awareness through videos, personal testimonies, simulation, and culminates in spending the rest of the night in a cardboard box. You can get a whole 8 hours of service through this event, while at the same time helping your community, challenging stereotypes, and expanding your mind. You can sign up at www.passitalong.org/boxcity. Don’t forget to send in your registration packet! 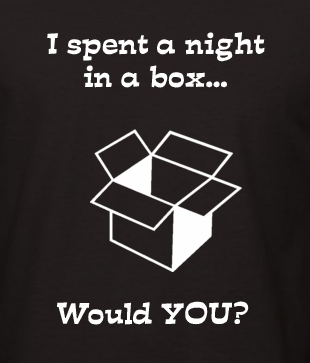 Once I rest up from my night in a box (or rather, staying awake watching everyone else sleep in a box…is that weird?) I will sprint over to the 24th, where Volunteer Recognition will be waiting for me at the Lake Mohawk Country Club. While the dress I have picked out and the song that my fellow AmeriCorps members will be performing might not draw you in (but it should), there’s a greater reason to attend. We’re there to celebrate YOU! This night is all about you, and everything you have done for us. If you’re a volunteer, community partner, sponsor, or service recipient we want to see you there. Get more information and RSVP by clicking here! In need of a vacation, I will wander to the weekend, Saturday the 27th, for Global Youth Service Day. This national day of service will be celebrated with a trip down the shore for a beach clean up. Fifty volunteers will take a bus together to Cliffwood Beach and become part of the efforts to restore the shore. Ahh, nothing like the smell of the salt air, wind in your face, and chasing an errant piece of trash down the warm, soft sand. Want to be a part of that? WHO WOULDN’T? Click here to sign up! And finally, with three days left, I can exhale and look back on the month in success. With a final wave, I will look forward to May. Hello Serve-A-Thon, fancy seeing you here. Ahh, spring break. That magical time of year when homework is scant, and the sandy beaches of parks and tourist destinations are filled with…volunteers!!! 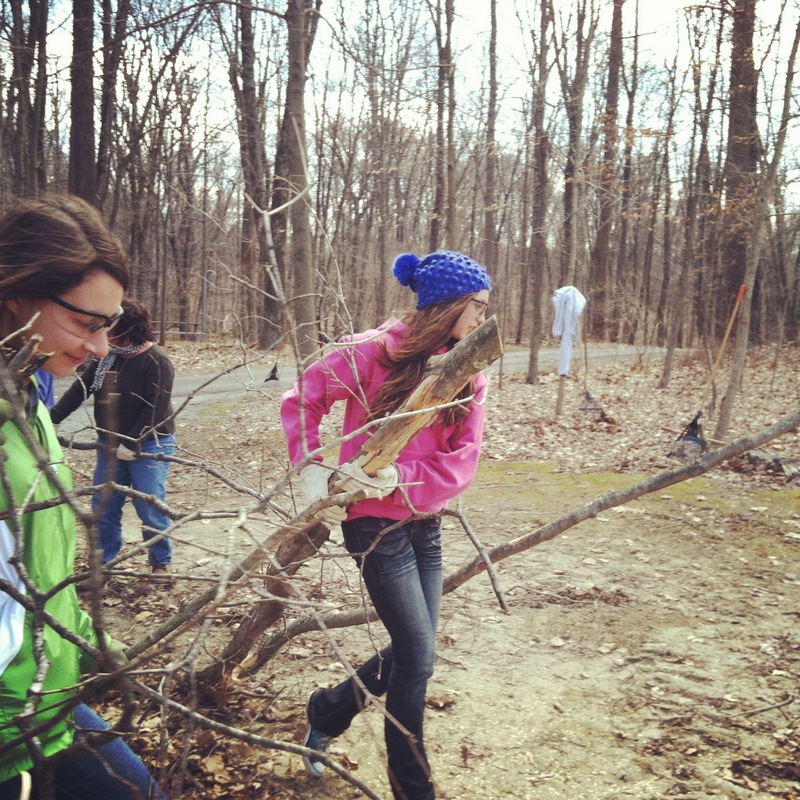 Each year there are a lot of people who “give up” their spring breaks for service. Lots of groups travel to Habitat for Humanity sites; to New Orleans for Katrina work; just about any other place you can think of that needs a helping hand. 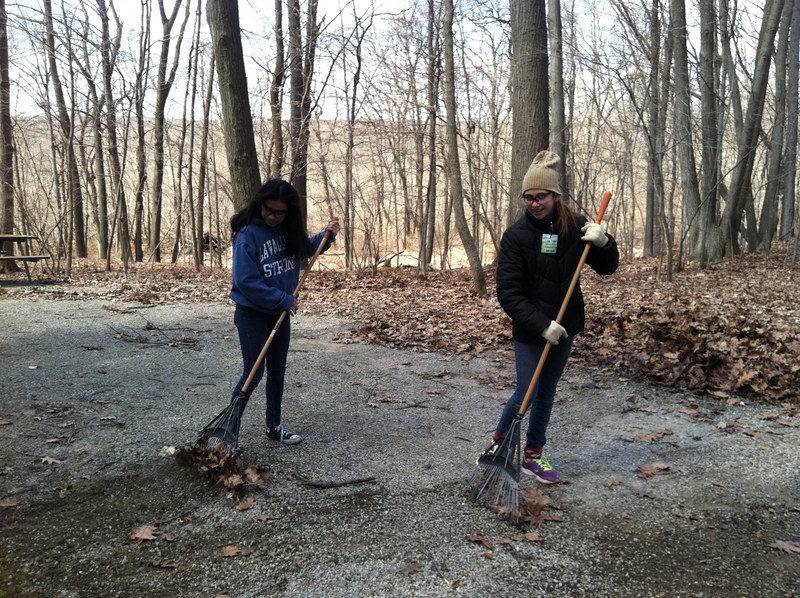 At Pass It Along this year, we are luck to have a dedicated group of Spring Breakers working with us to get Swartswood State Park into shipshape before the summer season begins in earnest in May. After Sandy, the park had a lot of tree damage, and as a result, campsite cleanups are hampered this year by an excessive number of sticks and large branches that made raking up fall leaves a difficult task. With help from about 30 volunteers over three days this week, we hope to lighten the burden on the small number park staff tasked with taking care of the park’s 10,000+ acres, doing essential work that would take their employees a long time to complete, while tying up skilled maintenance workers and delaying projects that really require their trained eyes, hands, and special skill sets. I went out yesterday with a group of seventh and eighth graders that are visiting the area and completing an alternative spring break week through Pass It Along. 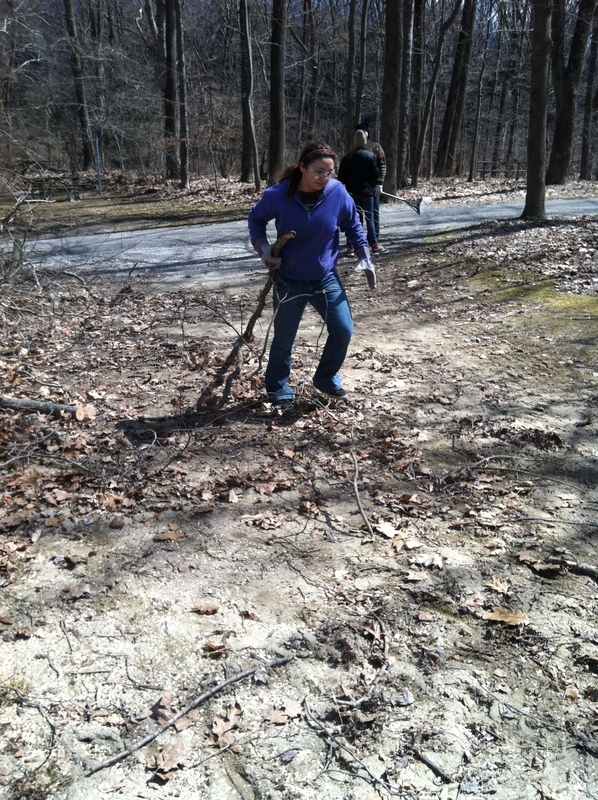 The task was daunting; the day was cold; and the work was physical. Campsites full of storm debris in addition to the usual amounts of wet leaves and fallen sticks were a sight to behold. I watched as everyone absorbed the task that they were being asked to complete before them. Rather than lots of groaning and eye rolling at the prospect of several hours working, everyone rolled up their proverbial sleeves (not their actual ones though, as it was breezy and chilly) and got to work. The next several hours passed in a whirlwind of raking, stick piling, neatening, tidying, and otherwise improving just under 30 campsites. It was amazing to see what a difference a group of people working together toward a common goal could make, and in such a short amount of time. While even I would admit that the last half an hour especially was tough, the accomplishments of the group made the hard work and hours outside in the cold weather worth it. I took today to work on things that needed my attention in the office, but I am looking forward to getting back at it tomorrow. Hopefully my biceps and back muscles will be recovered by then, too!